The Quinnipiac Bobcats men's hockey team was picked second in both the ECAC media and coaches polls as was announced at the league media day in Albany, NY. The team received one first place and 106 points in the coaches poll while they received three first places votes and 324 points in the media poll. 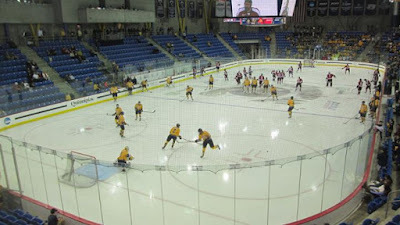 Quinnipiac is coming off a 23-15-2 season in which they finished in 5th place in the ECAC before falling to Harvard in the ECAC semifinals. The USCHO.com preseason poll also came out today and Quinnipiac came in a #14. Quinnipiac's junior captain Chase Priskie was also selected to the All ECAC Preseason 1st Team. The other players selected were Harvard's Ryan Donato, Yale's Joe Snively and Princeton's Max Veronneau as the forwards. Harvard's Adam Fox and Quinnipiac's Chase Priske are the defensemen. and the goalie is Harvard's Merrick Madsen.